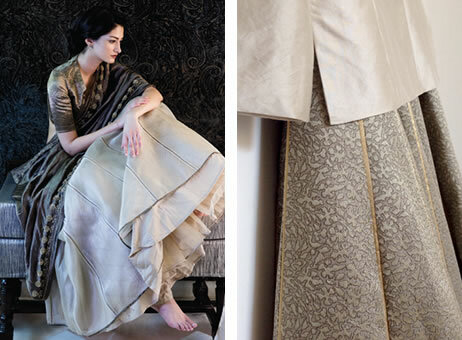 Atmosphere recreates the opulence and splendor of a bygone era with its new collection, Antarmahal. Antarmahal means 'inner chambers of the palace' and this collection has been designed to create luxurious spaces that befit modern-day royalty. In today's rushed world, where there is little time for reflection or introspection, inner space has become increasingly difficult to find. This collection will help to create regal but relaxing spaces, perfect for contemporary lifestyles but with the reminder of a more unhurried and pleasurable time. Antarmahal, from concept to creation, started with a clear vision of what our customers are looking for and how we can best help them create the spaces that will complement their lifestyles. This retelling of visual stories from our heritage involved painstaking research into colour palettes, motifs and technqiues. What has emerged is a transitional collection that is very rich at its core but extremely suitable for modern living. The Atmosphere Collaborative is a platform where we colloborate with and promote the design fraternity. As part of this, the Maharani's stunning ensembles were designed by renowned designer Sanjay Garg. Sanjay crafted the garments using our textiles as a base, and overlaid them with stitching techniques that take our fabrics to a different dimension. "Atmosphere approached me to develop garments for the Antarmahal collection campaign using their textiles. The appeal and common ground was that we all are - above all - focused on textile innovation. It is with this spirit we've come to collaborate on the limitless applications of fabric"